Alfred Döblin is obscure to non-academic readers of modernist literature, even by the standards of German-speaking writers who are known in this country mostly through their influence on other German-speaking writers; he has neither the name recognition (a term used loosely here) of Robert Musil nor the devoted following of Robert Walser. For whatever casual readership exists for translations of early 20th century fiction, his reputation is based entirely on Berlin Alexanderplatz—and even then, it’s often not the novel itself, but the TV miniseries adaptation by Rainer Werner Fassbinder. But Döblin, a Milhouse Van Houten-looking doctor who continued to practice in a working-class neighborhood of Berlin even as he became a respected literary figure in the 1910s and 1920s, wrote all kinds of stuff, including historical novels (which directly influenced the epic theater of Bertolt Brecht) and science fiction. 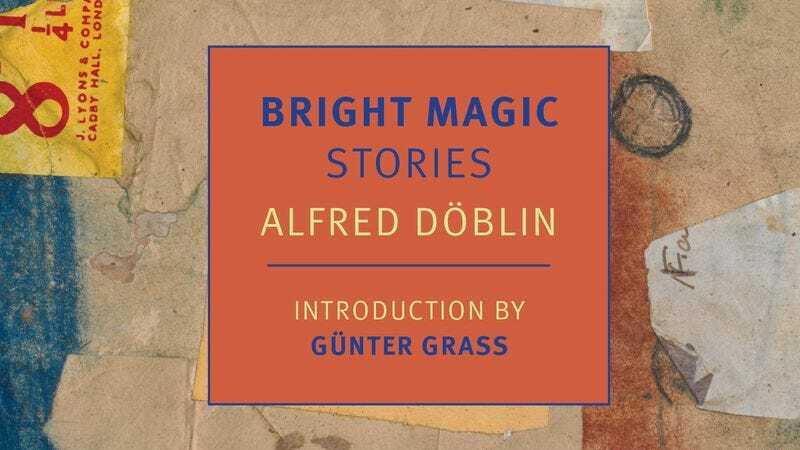 Bright Magic, a slim anthology of short stories edited and translated for New York Review Books by Damion Searls, makes a fitful case for Döblin as a writer. It consists of the full text of The Murder Of A Buttercup (labeled “Early Stories”), his debut collection of expressionist prose, first published in 1912, and a selection of ironic modernist quasi-parables written from the mid-1930s to the late 1940s (“Late Tales”). These two halves of the book (they’re roughly equal in length) fall on opposite sides of the most influential period of Döblin’s career, which lasted from the breakthrough of his novel The Three Leaps Of Wang Lun until the Third Reich forced him to leave Germany. The introduction, excerpted from a hype-man-esque speech by the late Nobel laureate Günter Grass, provides close to zero context. 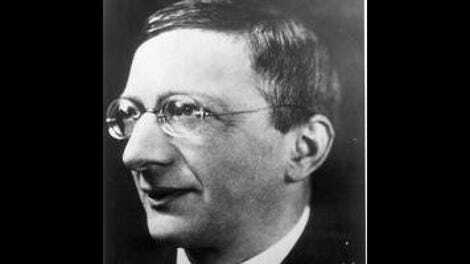 Almost everything written in English about Alfred Döblin has been written by Döblin scholars, who will point out that even the writer himself joked that there were multiple Döblins (the writer, the doctor, etc.) in conflict with each other. There are two in Bright Magic, though they both write about self-destructive pathologies—the Döblin of the “Early Stories” in the singular and the Döblin of the “Late Tale” in the plural, often referring to “everyone,” “the public,” “we.” The former is cruel, the latter whimsical and prone to droll sarcasm: “People say his great respect for books kept him from reading,” “…for those of the duchy to the south celebrated freedom so much that they kept it locked up in an undisclosed location in the ruler’s own castle and never let anyone get near it,” and so on. Both share a discomfort and fascination with female sexuality (he was “ignorant of female anatomy as late as the first semester of his medical studies,” claims David B. Dollenmayer in The Berlin Novels Of Alfred Döblin), an ambiguous relationship with death, and a couple of expositional tics, like the tendency to reveal characters’ proper names only in passing, paragraphs or sometimes pages after they’ve been introduced. The better “Early Stories”—many of them pushed forward by severely angular descriptions of women—either go full tilt into the writer’s detached obsessions (“The Ballerina And The Body,” self-explanatory) or merge them into dark fables. Set in a fanciful and inaccurate Boston, “The Other Man” is the most fully realized of these; the tale of a gynecologist who seduces his virginal secretary, forces her to become a cabaret dancer, marries her, and is talked into suicide by one of her admirers, it gives an edge to Döblin’s descriptive mania, cutting into a comic darkness. Its counterpart in the second half is “Traffic With The Beyond,” a nearly novella-length shaggy dog story in which a spirit medium in “the midsize English city of E.” is asked to channel spirits to help solve a murder. It’s necessary here, however briefly, to mention Döblin’s sense of humor. The thing about the European modernists—which inevitably either goes unmentioned or is badly overemphasized—is that almost all of them are funny. The stories in Bright Magic are marked by single-mindedness (which gets a little wearying in the “Early Stories”) that is sometimes offset by Döblin’s comic sensibility; more than a few end in mock morals, which resolve nothing. But Döblin’s humor is far less mysterious that, say, Franz Kafka’s. (Coincidentally, two stories collected here, “The Metamorphosis” and “A Little Fable,” share their titles with Kafka stories.) It’s more reactive deadpan, and can’t corrode on its own. The piece called “Five Incomprehensible Stories” ends Bright Magic on a note of inconsequentiality; a short collection of punch lines, it draws an inevitable and unflattering comparison to Daniil Kharms, the Soviet writer who perfected the absurdist paragraph-length story during his brief, eccentric, and tragic life. But in “A Little Fable,” a Gulliver’s Travels-esque description of neighboring kingdoms that take opposite (but ultimately interchangeable) attitudes toward freedom of expression; the sometimes laugh-out-loud funny “Traffic With The Beyond”; and the caustic “The Other Man,” the jokes he cracks shape and shade a view of the world where even the extraordinary and perverse is narrow-minded. Purchasing Bright Magic: Stories Amazon helps support The A.V. Club.